Many common household cleaning products may smell nice and quickly get the grime off of the shower but continued exposure to these products can cause health problems such as asthma, skin irritation, cancer, and hormone disruption. Most concerning is young children’s exposure to cleaning products as they play on the floor and often place almost anything in their mouths. Moreover, anti-bacterial products promote the growth of drug resistant bacteria and are no more effective than products that do not contain anti-bacterial toxins. Below is a list of common toxins found in household cleaning products and their dangers, see our guide Easy Steps to Cleaning Up Your Cleaning Products for information on how to avoid products with these substances. Also the Environmental Working Group tests thousands consumer products to determine their toxicity. Click here to find out what is in your cleaning products. 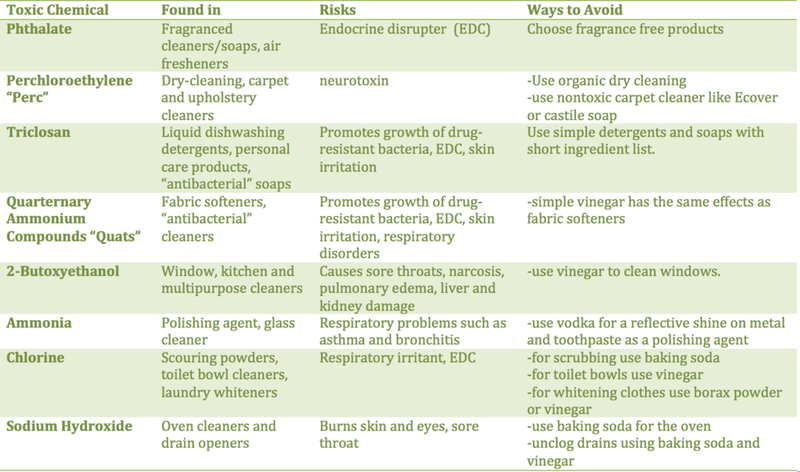 Below is a matrix detailing toxic chemicals in common cleaning products and healthy alternatives to decrease you and your family's exposure to these dangerous chemicals.